Essun has inherited the phenomenal power of Alabaster Tenring. With it, she hopes to find her daughter Nassun and forge a world in which every outcast child can grow up safe. Sometimes you only see how special something is when you look back at it later. Sometimes that something needs a hot second to properly settle into your subconscious. And that's fine, I figure. I'd go so far as to say that, for me at least, be it because the job requires me to read rather a lot or not, it's surprising to be struck by something straightaway. But even I didn't need the benefit of retrospect to bring home how brilliant the Hugo Award-winning beginning of The Broken Earth was. 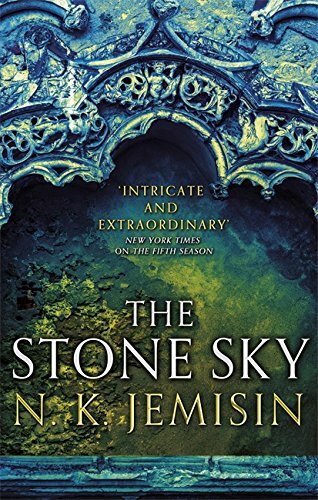 I realised I was reading something remarkable—something "rich, relevant and resonant," as I wrote in my review of The Fifth Season—before I'd seen the back of the first act, and when the full measure of the power of its perspectives was made plain, it became a comprehensive confirmation of N. K. Jemisin as one of our very finest fantasists. I stand by that, looking back—as I stand by my criticisms of its "surprisingly circumspect" successor. I said then that The Obelisk Gate sacrificed some The Fifth Season's substance and sense of momentum to tell a slighter and slower story, and I'll say that again today, never mind the passage of time or the news that it, too, just took home a Hugo. With The Stone Sky now behind me, however, and The Broken Sky closed, I do recognise that The Obelisk Gate played a pivotal role in the whole. It was the calm before the storm. And the storm The Stone Sky chronicles is one like none other.